Current global trends indicate a resurgence of mass transit in developed countries, and a rapid expansion of bus rapid transit (BRT) and metro systems in developing countries. In the face of increasing private motorization in countries like China and India, efforts to provide high quality mass transit will be crucial to ensuring high quality of life for urban residents. Photo by Tommy Vohs. This is the sixth post of the “Sustainable Urban Transport On The Move” blog series, exclusive to TheCityFix. Preparation of this series was possible thanks to a grant by Shell. Its contents are the sole responsibility of the authors. As highlighted in the most recent UN-HABITAT Global Report on Human Settlements, providing high quality mass transit like metro, light rail, and bus rapid transit (BRT) is essential for enhancing the economic, social, and environmental health of cities. This blog explores current trends around the world, which indicate a resurgence of mass transit in developed countries, and a rapid expansion of BRT and metro systems in developing countries. Many developed countries, including the United States and Canada, have experienced significant growth in mass transit throughout the past few decades – in the U.S., public transport ridership increased by 34% from 1995 to 2012. This trend is being driven by economic and consumer choice coupled with a spike in both the number and quality of mass transit systems in operation. In emerging economies, rapid urbanization is leading to unprecedented private motorization, but there’s a growing recognition that investing in urban public transport can help mitigate the negative impacts of motorization. The first BRT was implemented in Curitiba, Brazil in 1974, but it was the highly successful TransMilenio in Bogotá, Colombia that solidified BRT as a high-quality public transport option in 2000. The key benefits of BRT systems include cost effectiveness, relatively quick implementation time, high capacity, reliability, and comfort. Figure A. 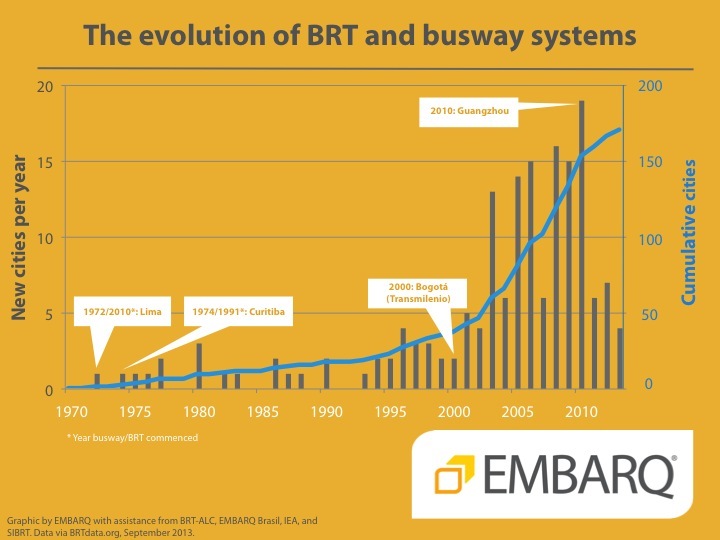 The growth of BRT and busways systems around the world. Graphic by EMBARQ. Data source: BRTdata.org. BRT and busways systems currently operate in 166 cities, cover 4,336 kilometers (2,694.27 miles), and carry nearly 29.7 million passengers daily. Latin American and Asian countries are driving the growth of BRT in emerging economies, and a recent study on global BRT systems indicated China and India as the two major markets for future growth. It has even been suggested that India may have already reached a BRT tipping point. Figure B. 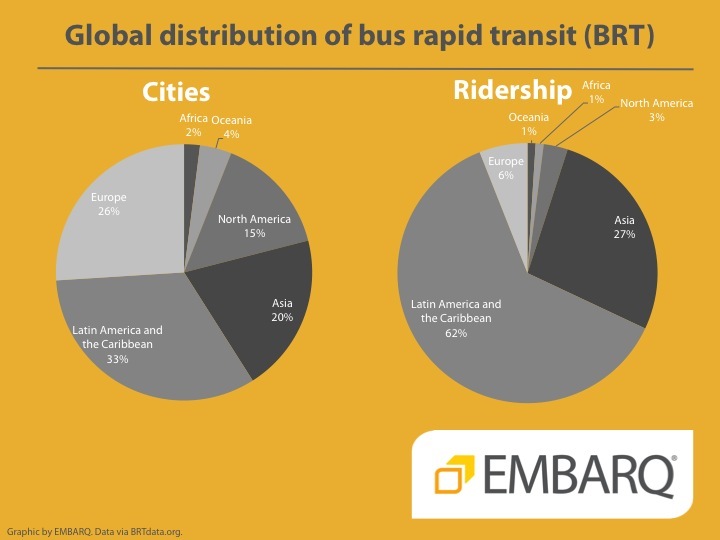 Global distribution of BRT – cities and ridership, 2013. 56% of cities with BRT systems are located in emerging economies, and Latin America and Asia together account for close to 90% of global BRT ridership. Graphic by EMBARQ. Data source: BRTdata.org. Metro systems have been an important provider of mass transit since the launch of the London Underground in 1863. There are now 187 cities with metros that carry an average of 111.5 million passengers daily. Like BRT, global growth in metro systems is primarily driven by emerging economies. For example, more than 30 Chinese cities are planning or constructing new metro projects, and the country plans to add 2,500 kilometers (1,553.4 miles) of metro by 2015. India is also on an ambitious path to scale up metro projects after the successful Delhi Metro Rail, which launched in 2002. With metro systems currently operating in four Indian cities, the country is planning to add 600 kilometers (372.82 miles) of new metro networks by 2016 in a dozen cities, including Chennai, Mumbai, and Hyderabad – a total planned investment of about US$40 billion by 2020. There’s also a renewed interest in metro across Latin America, with many cities expanding or upgrading existing metro systems, and others constructing new systems. 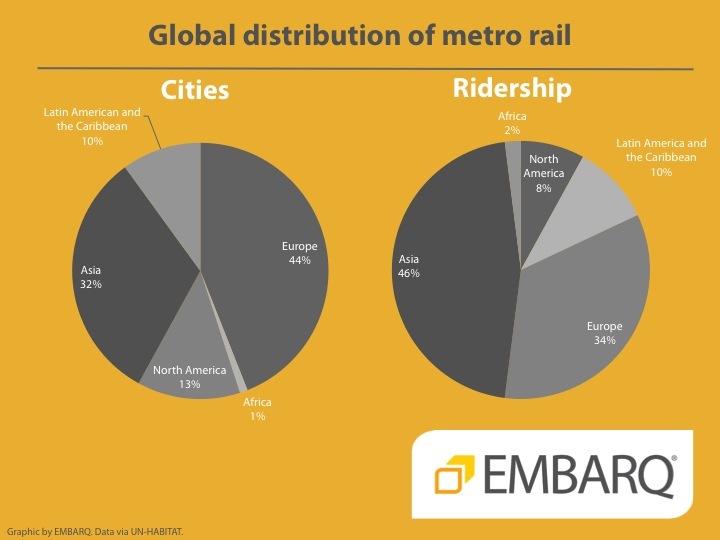 Figure C. Global distribution of metro rail – cities and ridership, 2012. Though Europe has the most cities with metro systems, Asia dominates global metro ridership with a share close to 50%. Graphic by EMBARQ. Data source: UN-HABITAT. Policy shifts at the national level that favor sustainable urban transport and increasing involvement by the private sector are among the key drivers promoting BRT and metro projects worldwide. 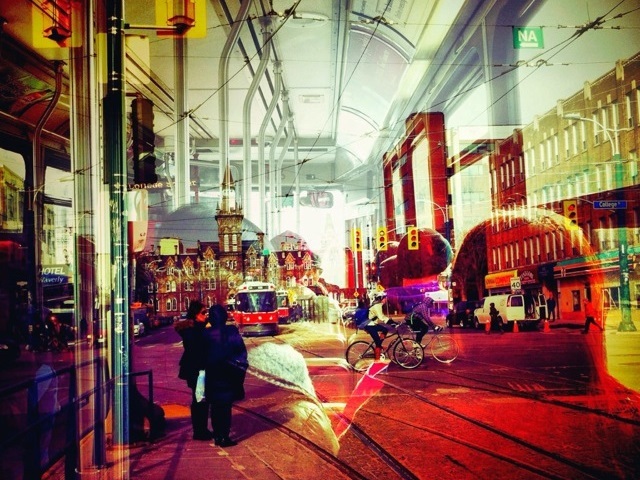 The establishment of national public transportation investment programs by many countries, particularly in emerging economies, signals a paradigm shift towards allocating national funding for mass transit projects away from highways in urban areas. Table 1. 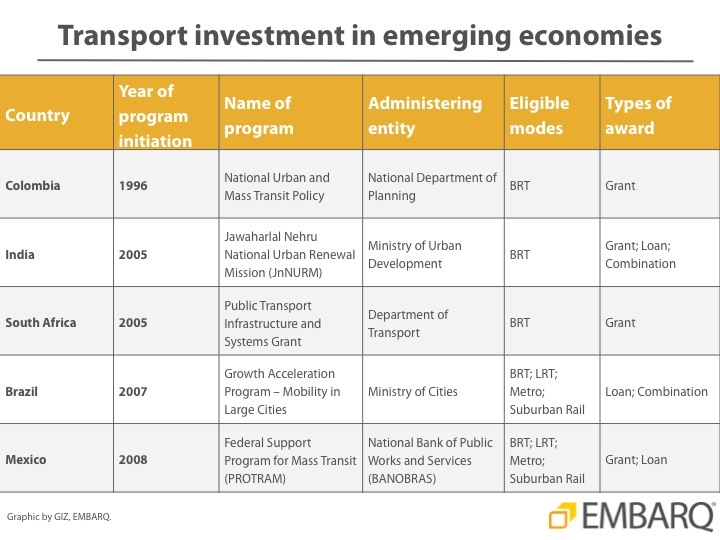 Selected national public transportation investment programs in emerging economies. Table by EMBARQ and GIZ. The capacity building and funding efforts of various international organizations, including UN-HABITAT and The World Bank, have been another major catalyst of sustainable urban transport projects. At last year’s Rio+20 United Nations Conference on Sustainable Development, eight of the largest multilateral development banks committed to investing US$175 billion in sustainable transport projects throughout the next decade – a major commitment expected to leverage large amounts of funding from national governments and the private sector and catalyze significant scaling up of mass transit. In the face of increasing private motorization in countries like China and India, efforts to provide high quality transit systems will be crucial to ensuring high quality of life for urban residents. To advance mass transit, four aspects are essential: building institutional capacity at the city level, promoting citywide integrated public transport networks, ensuring financial sustainability and performance benchmarking, and maintaining system affordability and safety for all. Dario Hidalgo, Juan Miguel Velásquez, Heshuang Zeng, Ryan Schleeter, and Kyle Mackie also contributed to this blog.